The Long Credit Card is a Long Card product. It offers two currencies, and functions as a standard international credit card that can be used both at home and abroad. 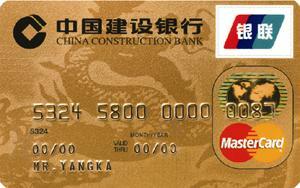 It is a real standard international credit card. You may make the repayment after consumption, and the grace period may be as long as 50 days. Credit consumption. You may make the repayment after consumption. You may lead the fashion and this card is a symbol of taste & quality. Dual currencies and global reach. 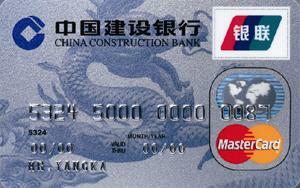 The Long credit card can be used both at home and abroad. It offers two currencies; domestic transactions are settled in the RMB, and overseas transactions are settled in the US dollar. Personalized design and password function. 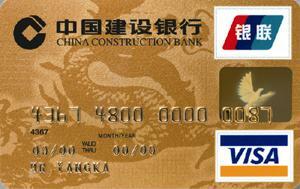 CCB is the first to introduce offers the consumer password function for the Long Credit Card (dual currencies). Easy wealth management and repayment. CCB offers account statement on a monthly basis to facilitate your wealth management. There are many repayment methods available. Authorized merchants and VIP treatment. CCB selects authorized merchants to provide you with preferential treatments and VIP treatment. Loss reporting through telephone and risk-free. You may report the loss over the telephone. CCB will provide safety guarantee and you need not to worry about any risks. Priority treatment of disputed items. We will give priority to the treatment of the consumption items over which you have disputes. You may make the payment when the items are verified. You may use the card with less concerns. Considerate service and free of worries. If you lose you card abroad, CCB will provide emergency card and emergent cash withdrawal services to facilitate your trip and make you feel at home. 1) Card number. 16-digit outstanding number is the card number of your Long Debit Card. 2) Period of validity (m/y). 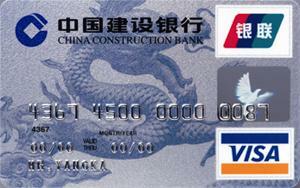 The period of validity of the card is shown on the right side. The expiration date is also the date for changing or extending your card. 3) Pinyin/English name. The Pinyin/English name you sign on the application form will be shown on the right sides. 4) Logo. The logo represents the card type. You may consume in our authorized merchants that recognize the logo or advance cash in the ATMs that recognize the logo. 1) 24-hour service hotline. If you have any doubt, please call our toll-free hotline 800-820-0588 anytime. For mobile phone users and regions where 800 services are not available, please dial 021-38784878 or 021-50504750. 2) Magnetic strips. You personal information is stored in the magnetic strip. Do not scrape it, put it close to hot temperature or strong magnetic field or put it together with magnetic objects. 3) Signature column. When you get your card, please sign your name in the signature column. (Note: please do not alter the signature and ball pen is recommended). The signature must be consistent with your signature on the application form. 4) 7-digit number. The first 4 digits is the last 4 numbers of your card number and the last 3 digits are safety numbers. When you use your card for special transactions such as TV telephone or online shopping, the issuing bank will use these three numbers to verify your identity.